When our country entered a recession in 2000 and finally had the opportunity to heal itself, the Federal Reserve and our government would not allow this to occur. They pumped a massive amount of printed money and stimulus into the economy creating artificial prosperity through a housing bubble. Hundreds of thousands of artificial jobs were created to sell houses, finance mortgages, and build way more houses than we needed. Many have hoped that the Federal Reserve and government's new programs of massive money printing and housing stimulus would recreate the bubble and bring back the artificial jobs. So far the plan has not worked. 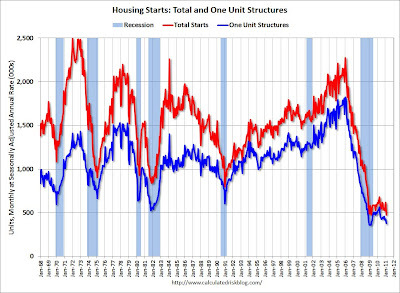 The housing starts this morning came in at 479,000 in February, down 22.5% month over month, and just above the all time record low of 477,000 in April 2009. 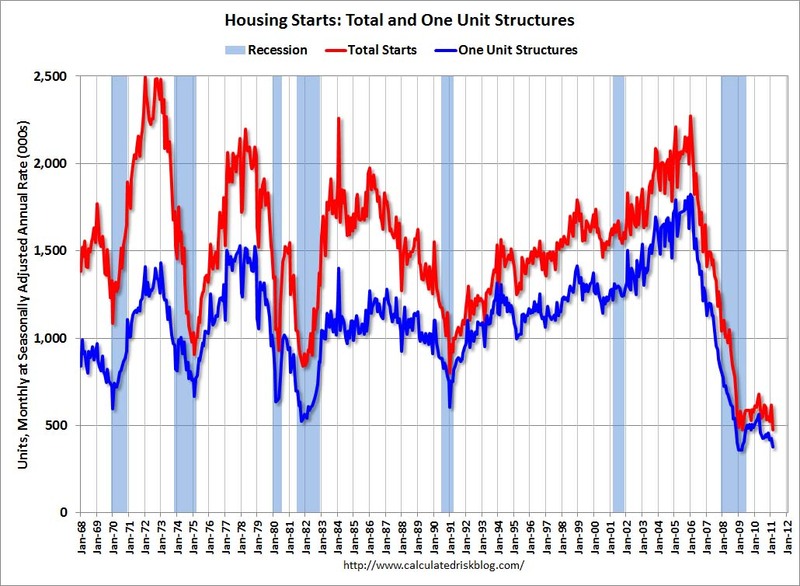 Single family housing starts were down 11.8% at 385,000. With housing unable to perform another miracle, it will be back to Plan A for the Obama administration and current Federal Reserve. They will try to stimulate the economy with government spending and transfer payments paid for by the Fed's printing press. It is the final stage of the American ponzi economy. When this final bubble explodes, and our government debt and currency both collapse in value, the true economic depression will finally begin.